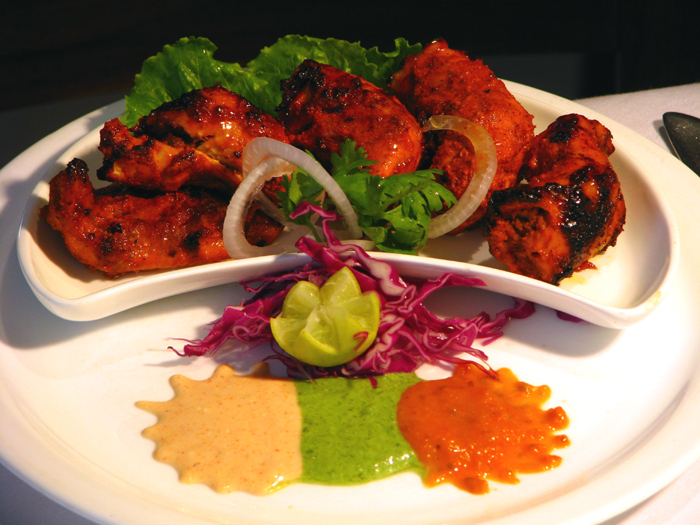 Chicken tikka is a dish of South Asia. It is traditionally baked skewers with small pieces of chicken, usually boneless, in a clay based oven called tandoor, after marinating in spices and yogurt. Left: Chicken tikka served in Mumbai, India. The literal meaning of tikka in the Persian, Urdu, and Punjabi languages is "bits, pieces". The Punjabi version of the dish, however, is barbecued on red-hot coal and does not always contain boneless pieces. The pieces are brushed with ghee (clarified butter) at intervals, which gives its taste, while being continuously fanned. It is typically eaten with a green coriander & tamarind chutney, served with onion rings and lemons, or used in preparing a chicken tikka masala. A chicken tikka sizzler is a dish where Chicken Tikka is served on a heated plate and is served with onions. The dish is also known and eaten in Afghanistan, though the Afghan version (generally like Persian and Arab dishes) is less spicy compared to the Indian version.